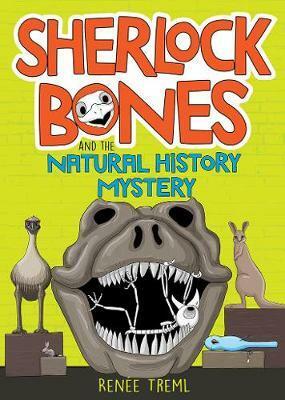 Picture book author Renée Tremel’s first junior graphic novel takes place inside a natural history museum. Sherlock Bones is a very talkative bird skeleton. His best friend is not as talkative. In fact, his best friend is a dead parrot. Nevertheless, they have made it their business to find out who has stolen a beautiful and extremely valuable blue diamond. Their goofy investigation leads them on an unhinged tour around the museum where they encounter dinosaurs, beetles, butterflies and more. There’s a sassy racoon acting very suspiciously but she may be simply a greedy chocolate thief. There are plenty of facts about the natural world to be found along the way for curious readers. Importantly, there are also a lot of laughs. This is an offbeat, fun mystery that is absolutely perfect for readers who have enjoyed the Bad Guys, the Real Pigeons or the Mr Penguin books. For readers aged 7+.